Buckwheat, despite the name, is not wheat and is Gluten Free. So it came as a big surprise when my wife told me that a packet of Doves Farm Wholemeal Buckwheat Flour she had bought was carrying several confusing messages! 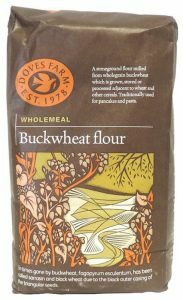 Buckwheat flour is low in gluten and well suited to cake and biscuit baking. For bread baking combine buckwheat flour with a strong bread flour. Ingredients: Buckwheat flour (contains GLUTEN). The moral of the story is this – ALWAYS read the label no matter how familiar you feel you are with a particular product or name!